What you are getting in Master course on Technical Analysis? A. 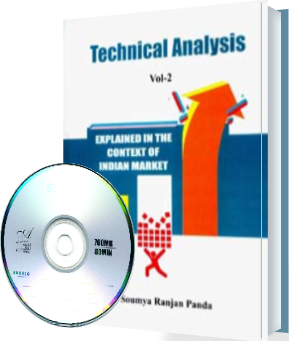 Technical analysis volume-2 book..
B. One DVD of duration 4 hrs 30 minutes..
A. Understand the price time Chart, trend line, gaps and price averages. B.Trade using the Trend line. D.Types of Moving averages and their use. G.Different approach of technical analysis for Stock Investment and stock trading. H.Examples and practice lessons to complete the learning. B.Different Flag pattern and its application. C.Different Triangle patterns its application. D.Procedure to Practice the linear patterns in trade forecasting. E.Head and solder, double top, double bottom non linear pattern and its use. F.Procedure to Practice the non linear patterns in trade forecasting. G.Best Pattern analysis tricks for Stock Investors. H. Extended set of Examples and practice lessons to complete the learning. B.Procedure to apply moving average and oscillator in trade analysis. Mathematics of trend continuation pattern. Understanding big M and Big W chart pattern. 3 best indicators for trend identification.